May God bless everyone who is reading this message. My name is David Berkowitz and I am a prison inmate who has been incarcerated for more than 22 years. I have been sentenced to prison for the rest of my life. I was the notorious murderer known as "Son of Sam." It was 11 years ago, when I was living in a cold and lonely prison cell, that God got hold of my life. Here is my story of hope. Ever since I was a small child, my life seemed to be out of control. I was like a wild and destructive animal. My mother had no control over me. My father had to pin me to the floor until I calmed down. When I was in public school, I was so violent and disruptive that a teacher had to grab me in a headlock and throw me out of his classroom. I got into a lot of fights. Sometimes I started screaming for no reason. I was plagued with bouts of severe depression. Eventually my parents were ordered by the school officials to take me to a child psychologist, or else I would be expelled. I had to go to the psychologist once a week for two years, yet the therapy sessions had no effect on my behavior. Thoughts of suicide often came into my mind. Sometimes I spent time sitting on a window ledge with my legs dangling over the side. We lived on the 6th floor of an old apartment building. When my dad saw me doing this he would yell at me to get back inside. I had no idea what to do and neither did my parents. They had me talk to a Rabbi, teachers, and school counselors, but nothing worked. When I was 14, my mother was stricken with cancer. Within several months she was dead. I had no other brothers or sisters, so it was just my dad and me. He had to work 10 hours a day, six days a week. We spent very little time together. For the most part, my mother had been my source of stability. With her now gone, however, my life quickly went downhill. I was filled with anger at the loss of my mom. I felt hopeless, and my periods of depression were more intense than ever. I also became even more rebellious and began to cut out of school. My dad tried to help as best he could. He managed to push me through high school. The day after I graduated, I went into the Army. Even in the service I had trouble coping, though I did manage to finish my three-year enlistment. I got out of the service in 1974 to start life again as a "civilian." All my friends that I knew before had either married or moved away. So I found myself alone and living in New York City. In 1975 I met some guys at a party who, I later found out, were heavily involved in the occult. I had always been fascinated with witchcraft, Satanism, and occult things since I was a child. When I was growing up, I watched countless horror and Satan-type movies, some of which totally captivated my mind. Now I was 22 and the forces of Satan were becoming more and more evident in my life. I felt as if something was trying to take control of my life. I began to read the Satanic Bible by the late Anton LaVey who founded the Church of Satan in San Francisco in 1966. I began, innocently, to practice various occult rituals and incantations. I am utterly convinced that something satanic had entered into my mind and, looking back at all that happened, I realize that I had been slowly deceived. I did not know that bad things were going to result from all this, yet over the months the things that were wicked no longer seemed to be such. I was headed down the road to destruction and I did not know it. Maybe I was at a point where I just didn't care. Eventually, I crossed that invisible line of no return. After years of mental torment, behavioral problems, deep inner struggles, and my own rebellious ways, I began committing horrible crimes. Looking back, it was all an awful nightmare and I would do anything if I could undo everything that happened. Six people lost their lives. Many others suffered at my hand and will continue to suffer for a lifetime. I am sorry for this. In 1978 I was sentenced to about 365 consecutive years, virtually burying me alive behind prison walls. When I first entered the prison system I was placed in isolation. I was then sent to a psychiatric hospital because I was declared temporarily insane. Eventually I was sent to other prisons including the infamous "Attica." Ten years into my prison sentence, when I was feeling despondent and without hope, another inmate came up to me as I was walking the prison yard one cold winter's evening. He introduced himself and began to tell me that Jesus Christ loved me and wanted to forgive me. Although I knew he meant well I mocked him because I did not think that God would ever forgive me or that He would want anything to do with me. Still this man persisted, and we became friends. His name was Rick, and we would walk the yard together. Little by little he would share with me about his life and what he believed Jesus had done for him. He kept reminding me that no matter what a person did, Christ stood ready to forgive if that individual would be willing to turn from the bad things he was doing and would put his full faith and trust in Jesus Christ and what He did on the cross - dying for our sins. He gave me a Gideon Pocket Testament and asked me to read the Psalms. I did. Every night I would read from them. It was at this time the Lord was quietly melting my stone-cold heart. One night I was reading Psalm 34. I came upon the 6th verse which says, "This poor man cried, and the Lord heard him, and saved him out of all his troubles." It was at this moment, in 1987, that I began to pour out my heart to God. Everything seemed to hit me at once - the guilt of what I had done and the disgust at what I had become. Late that night in my cold cell I got down on my knees and began to cry to Jesus Christ. I told Him that I was sick and tired of doing evil. I asked Jesus to forgive me for all my sins. I spent a good while on my knees praying to Him. When I got up it felt as if a heavy but invisible chain that had been around me for so many years was broken. A peace flooded over me. I did not understand what was happening. In my heart I just knew that somehow my life was going to be different. More than 11 years have gone by since I had that first talk with the Lord. So many good things have happened in my life since. Jesus Christ has allowed me to start an outreach ministry right here in the prison where I have been given permission by prison officials to work in the "Special Needs Unit." This is where men who have various emotional and coping problems are housed. I can pray with them as we read our Bibles together. I get the chance to show them a lot of brotherly love and compassion. I have worked as the Chaplain's clerk and also have a letter writing ministry. In addition, the Lord has made ways for me to share with millions via TV programs such as Inside Edition. I have been able to share what He has done in my life, as well as warn others about the dangers of involvement in the occult. "For whoever calls on the name of the Lord shall be saved." Here it is clear that God has no favorites. He rejects no one, but welcomes all who call upon Him. I know that God is a God of mercy who is willing to forgive. He is perfectly able to restore and heal our hurting and broken lives. I have discovered from the Bible that Jesus Christ died for our sins. He took our place on the cross. He shed His blood as the complete payment God required for our sins. The Bible says, "All have sinned, and fall short of the glory of God" (Romans 3:23). Furthermore, it says, "the wages of sin is death, but the gift of God is eternal life in Christ Jesus our Lord" (Romans 6:23). These passages make it clear that everyone has sinned. Some like myself, are worse sinners than others, but all have sinned. Therefore, we must all acknowledge our sins before God, own that we deserve God's judgment for eternity, and realize that we are LOST! When we reach the point of realizing that we are lost, guilty, ruined sinners, then we will be ready to accept the Savior whom God has provided for us. Who is this Savior? who has come into this world as a Man. As perfect, sinless Man, He suffered and died on the cross for our sins (1 Corinthians 15:3; 1 Peter 2:24; 3:18). on the third day He rose again in victory, for death could not hold Him. If you realize you are lost and need a Savior, then place your full, undivided faith and trust in the Lord Jesus Christ who died for your sins. "He was wounded for our transgressions, He was bruised for our iniquities: the chastisement of our peace was upon Him; and with His stripes, we are healed" (Isaiah 53:5). Have you put your name in this verse? To reject the Lord Jesus Christ and His work on the cross is to reject God's perfect and only gift of salvation and eternal life. "If you confess with your mouth the Lord Jesus and believe in your heart that God has raised Him from the dead, you will be saved. For with the heart one believes unto righteousness, and with the mouth confession is made unto salvation" (Romans 10:9-10). So believe in your heart that these words from the Bible are true and apply to you. Please consider what I am saying. I beg you with all my heart to place your faith in Christ right now! Do not be ashamed to do this! Do not wait for a more convenient time! Tomorrow is promised to no one. Do not wait for your death bed, for you may not have one! "Behold, now is the accepted time; behold, now is the day of salvation" (2 Corinthians 6:2). "We shall be like Him, for we shall see Him as He is" (1 John 3:2). I am not sharing this message simply to tell you an interesting story. Rather I want you to taste the goodness of God in the life of a man who was once a Satan-worshiper and a murderer, to show you that Jesus Christ can bring about forgiveness, hope, and change. I was involved in the occult and I got burned. I became a cruel killer and threw away my life as well as destroying the lives of others. Now I have discovered that Christ is my answer and my hope. He broke the chains of sin, self-will, and depression that had me bound. He has turned me from a path leading to eternal damnation in the lake of fire to the blessed assurance of eternal life in heaven. 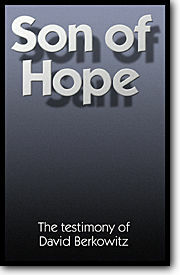 God has miraculously transformed "Son of Sam" into "Son of Hope." He wants to perform the same kind of transformation in your heart and life today! Thank you for reading this. May God bless you.